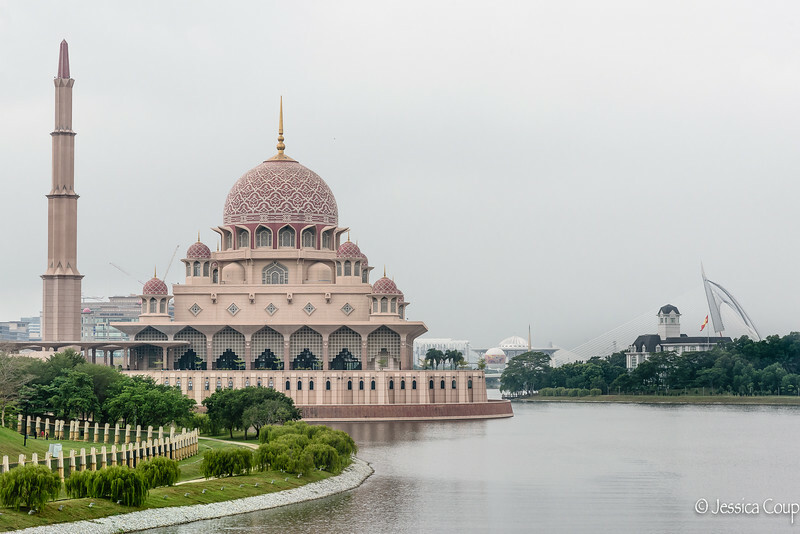 The seat of government power in Malaysia was moved from Kuala Lumpur in 1999 to a newly-designed town of Putrajaya. While Kuala Lumpur is still the national capital, the federal administrative center is based in Putrajaya due to overcrowding in Kuala Lumpur. The 40 minute/35 KM drive between the two cities is a nice day trip to soak in some nature at the botanical gardens or spend some time on the 650 hectare man-made lake. Over 38% of Putrajaya is “green space” and 92 hectares are part of the Putrajaya Botanical Gardens, the largest botanical garden in Malaysia. The parks have become a favorite for locals to spend time biking, walking and having family picnics. Even in the early morning the park was filled with numerous planned acitivites along with recent graduates who found the park’s Moroccan Pavilion a great backdrop for graduation photos. Between the lush green parks, beautiful government buildings, striking bridges, palaces and a mosque floating over the water this organized and natural city is quite zen.